This is my new best friend, I have been struggling all week with an infection and finally got my antibiotics today. I am grateful to live in a country where they are not only available but also at a reasonable cost thankfully I shall soon be feeling better and back to my usual bouncy self. The reason this little cushion is my best friend is that it is filled with bulgar wheat, you can heat it up and this lovely warm square sits on my lap and gives such a gentle comforting heat that eases the tummy pain. I love how things evolve, I made the ribbon weave last year and created the front with the little buttons and hand embroidery but then I did not quite know what to do with it. I had plans to make it a wallhanging, or a cushion but it was only the other day that I realised it was the perfect size for a wheat bag, (about 20cm square). When you are feeling poorly there is nothing like a bit of love and warmth to ease the pain and this little heart has finally found its place in the world. You can make all different shapes long sausage shapes to go round an aching neck, I have even made a eye mask for a lady who had fallen and bruised her eyes. You can also put these in the freezer to keep you cool for bruising or headaches. I backed it with the remaining teal velvet I was given at a WI meeting two or three years ago. 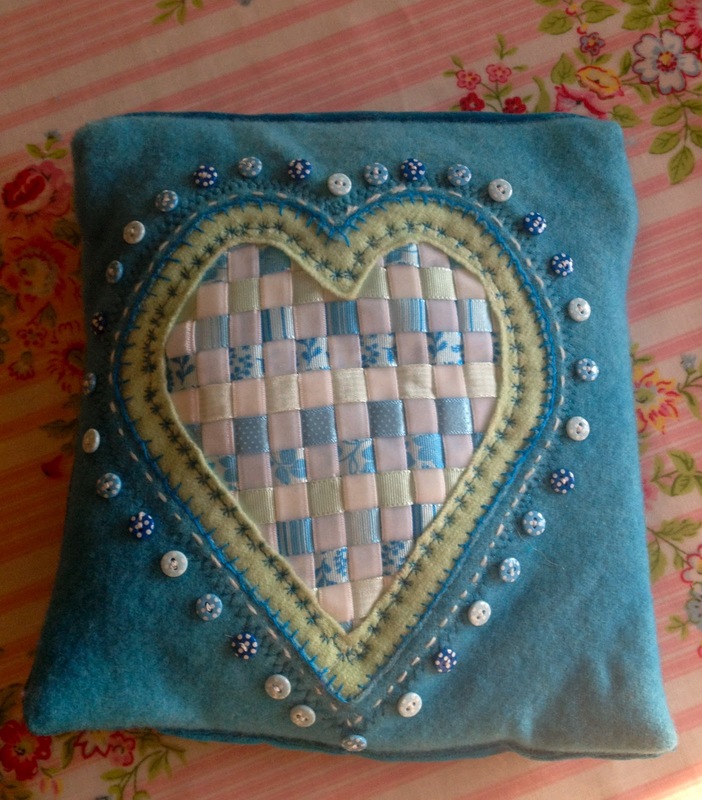 I had made a Christmassy cushion with it as well and had shown it to the sewing world editor earlier in the year, she wanted it for a project and so I thought I would give it a wash, that wasn’t the best idea because the fabric was not colour fast! It was a disaster and I had to start all over again! Have you tried shopping for christmas fabrics in early August? giggles the shop assistants do doubt my sanity at times, but they know me well not to raise their eyebrows until I have left the shop!